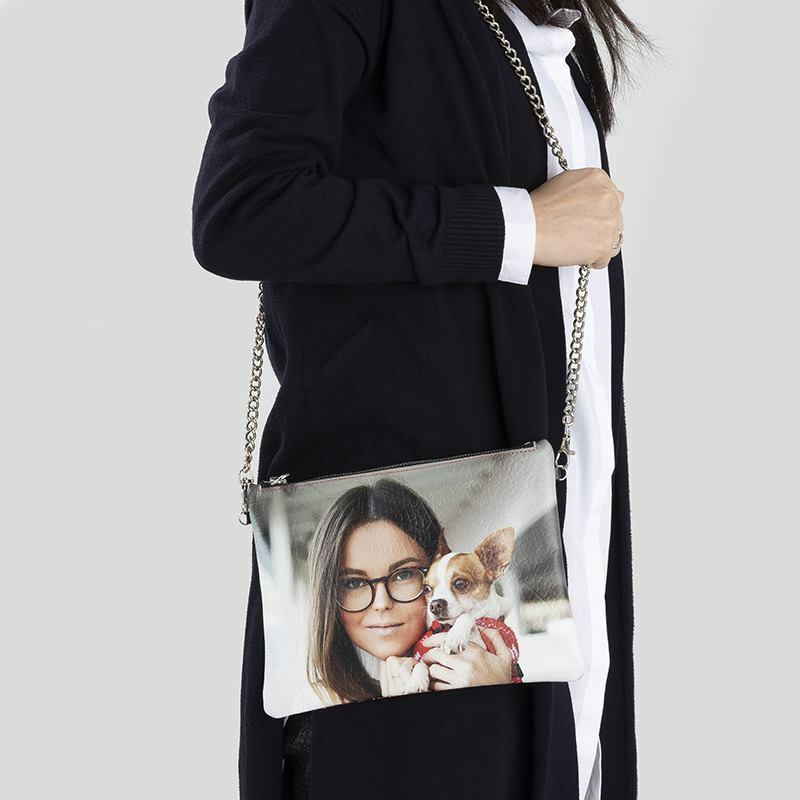 Make personalized cross body purses using your favorite photos. This stunning personalized cross body bag is available in your choice of either smooth or textured 100% Italian Nappa goat leather, or in a faux leather option. Lined with a super-soft, beige Suede Vision fabric, this leather cross bag features a 42in nickel-plated chain which you can detach using the silver colored chain clips. Turn heads wherever you go with your personalized cross body purses featuring your favorite photos. If you can't choose your favorite photos for your personalized cross body purses then why not create a collage using a whole handful of them? You can use one of our pre-set montage templates, or you can create your own from scratch, and what's more, as you can design the front and back of your bag separately, you can use different pictures for each. Your personalized cross body purses have been designed in-house by our very own exclusive handbag designer. Now that it's been designed, when you place an order our printing technicians will use modern digital printing techniques that are tailored specifically for leathers to print your photos onto the material. This is then passed onto the craftsmen who will cut the leather (or leatherette) to size, based on the pattern provided by the designer. Our expert seamstresses will then stitch everything together, using the thread color that you chose when you placed your order before our quality control team give everything a thorough checking over. A lined leather clutch made from a single piece of leather. Small or large options and a vegan-friendly leatherette.